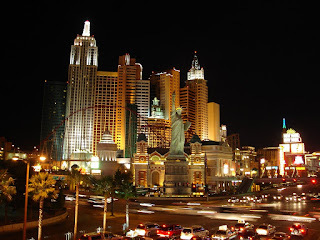 Tuesday, we made it into the city of Las Vegas, we mingled with lots of rather "different" Trekkies and we were blasted into space to fight the Klingons and evade the Borg nanoprobes... What a busy day! We were out kind of late last night - no, not by most people's standards, but our kids are used to going to bed between 7:00-7:30 so 9:00pm might as well have been midnight to them. We knew if we didn't let them get some extra rest we would have a "scardey cat" and a "screaming diva" on our hands - so let them sleep we did. When the two princesses finally awoke, we had a quick breakfast and got ready for a trip to the ever popular pool. The pool at the Excallibur is pretty great. On one side, you have water slides where the kids like to hang out. On the other side (today it was nice and shady until about noon) is the more subdued side, not too deep (so the kids can play), lots of chaise lounges and, most importantly, a bar where one can acquire lovely fruity, frozen beverages. At 10:00am it was already quite warm, in the high 80's is my guess, so a couple of hours by the pool, sipping a frozen concoction chatting with my Mom on my cellphone (My Mom just so happened to be about ten miles away at my Brother's house that week [she's usually about 20 miles from my house] helping them pack to move back to California). The girls had a great time, Eric got to relax in the chaise lounge next to me and our morning was complete. At about this point, the girls were pointing out that they really wanted to visit Circus Circus' Adventuredome. 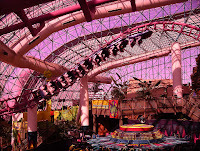 The Adventuredome is a 5acre indoor, climate controlled theme park that is part of Circus Circus hotel and casino. They have everything you can think of all crammed into this giant pink glass dome, a looping roller coaster, boat flume ride, a drop ride and lots of kids rides. So we head on over, reminding them that they'll only be able to stay for a little while as we had tickets to a show at 4:00. Of course, they talk us into the wristbands (instead of just a few individual ride tickets) and they spin, loop, drop and twist until they're dizzy. They had a great time! The clock strikes 2:30 and it's time to make our way back to the car so we can head down the road to our show. Unfortunately, we had forgotten how bad the traffic is on "The Strip"... 45 minutes later and we were only about a mile further than when we started. This called for some super-duper crafty driving... over to a side road, a zig-zag to another, cut through a giant parking lot and we're at the Planet Hollywood parking lot by 3:40... whew! 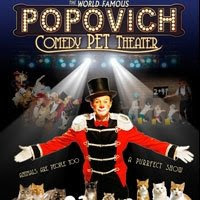 We quickly made our way to the "V Theater" and were seated in plenty of time for the 4:00pm performance of the Popovich Comedy Pet Theater. Gregory Popovich was a semi-finalist on "America's Got Talent" last year, I vaguely remember seeing him. I guess if you make it to the semi-finals or better on "America's got Talent" you're pretty well assured of getting some sort of gig in Vegas as we've seen tons of shows featuring these contestants advertised all around town. The show was cute, the girls laughed until their stomachs were sore - I'm not really into animal acts, but it was cute. 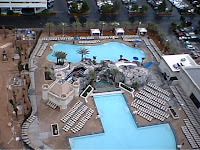 When the show was over, we made our way back to our hotel and took the tunnels to the Mandalay Bay. We had a little dinner and headed back to our hotel to settle in for the evening. We're heading home today... Two full days just isn't enough time in Vegas (especially when you spend one of them traveling though outer space!). We're going to wait until around noon to head home that way we will miss all the commute traffic at home so we hang out and wonder around until late in the morning. In the car, I reflect upon our trip... A trip with my kiddos is always a trying experience. One (collette) absolutely refuses to use any toilet that flushes automatically - try searching all over for a "regular flush" one (as she calls them) in a big city like Vegas! My other kiddo (lauren) is the pickiest eater ever known to man, she pretty much lives on chicken nuggets when we're not at home - she has been known to go an entire day without eating on a trip because nothing appealed to her! Yes, another trip is just what Eric and I need... maybe one just the two of us - we haven't been on a vacation alone since our honeymoon, 14 years ago - we've always had someone with us, be it in-laws or kids. Yes, I think I'll start secretly saving up for a second honeymoon, just the two of us... a vacation where we can eat anywhere we want and not have to worry if they have chicken nuggets on the kids menu and also where we don't have to scout the restrooms in advance to see what kind of "flush" they have! Do it Liz! You won't believe how much better you two will feel. My hubby and I hadn't been on an alone vacation either since our honeymoon, which was 10 years before. You'll re-kindle what it was like before the kids, stress, drama, etc. It's very important to have that "together time" for more than a few hours minutes or hours! Vegas is a lot of fun. You should go away with your husband. I know I could sure use that too. By the way, you received an award from me. Visit Healthy Moms for all the details. Congratulations!